Puja is the co-founder and managing partner at Recalibrate. She is a Columbia University Certified Executive Coach(ACI, Columbia University) and certified Neethling Brain Instrument(NBI – Whole Brain Thinking) practitioner with an exemplary track record of developing and coaching leaders who have created an impact at personal and organization level. She takes extreme delight in working with those leaders (men and women both) and organizations who are open to change, willing to experiment and not tentative to tread the un-chartered territory to find a better version of themselves. Puja has over two decades of experience across IT Consulting, Outsourcing, Delivery and Executive/Organisational Coaching. 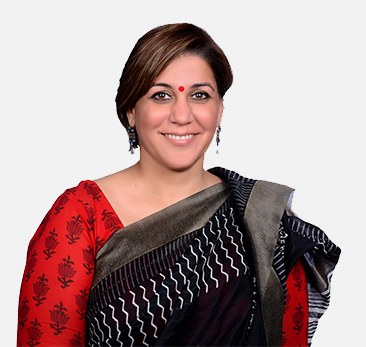 Through her own unique style, which is grounded in Whole Brain Thinking, empathy, instant rapport and business acumen, she has done executive and business coaching for various senior leaders in global organisations like Credit-Suisse, Publicis.Sapient , GlobalLogic, Hero Motocorp to name a few and also coached various founder company CEOs. Her coaching style blends over 20 years of her own corporate & senior management expertise while holding multiple leadership positions globally, developing & mentoring senior leaders for multiple years, a deep rooted passion for genuinely working with people & research based Columbia University coaching content/methodology. Her underpinning of coaching is in Whole Brain Thinking, Emotional Intelligence, Positive Psychology , Neuroscience & Business Strategy. Prior to joining hands to take the flagship of Recalibrate ahead with Dr. Deep Bali, Puja’s last assignment was with Sapient Consulting as Vice President. In her role as India Delivery head for North America investment management clients, she was responsible for a multi-million $$ portfolio. She lead & scaled various large scale engagements spanning across multiple cultures and geographies. She headed the Sapient India Women leadership network and was instrumental in making it mainstream. Prior to Sapient, her business and leadership experience is varied across domains of Insurance, Travel & Hospitality in multiple leadership positions. Puja has three lovely daughters and loves being with them. She is an explorer by heart & has meditated in the buddhist caves of Padmasambhava in the Himalayas. She finds her expression through doodling, orating, blogging and cooking exotic dishes. Bachelor of Physics(Hons’) from the University of Delhi (India).